It wasn’t too long after publishing my book, Stuttering is Cool: A Guide to Stuttering in a Fast-Talking World, when I was itching to draw and publish more Franky Banky comics. So I had decided to revisit a dream of mine and create something like a Franky Banky magazine much like the Bone series by Jeff Smith back in the 1990s when he was releasing each new issue every two months. My plan was to include commentaries and little ads for the next issue and it any questions came in from readers, I could include them, too. So in 2015, I launched what started out to be a trilogy. 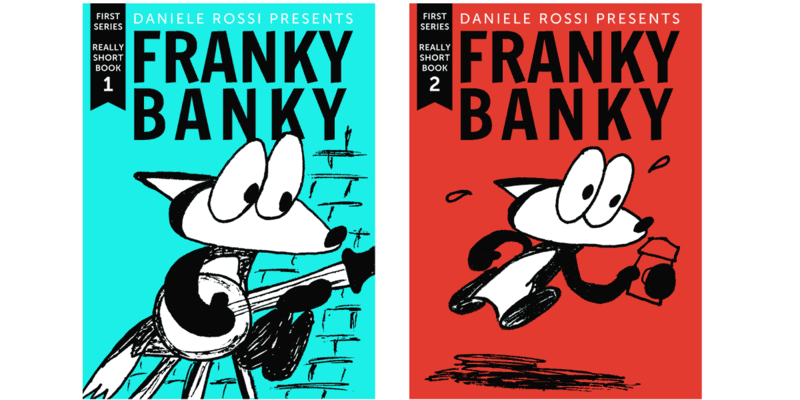 Franky Banky Really Short Book 1 and Franky Banky Really Short Book 2. I chose Gumroad as the platform and decided to make set a pay-what-you-want price. However, two things prevented me from completing the trilogy. The first was that I had burned myself out after I posted the second issue. I was working on the comic books pretty much all of my spare time on top of my day job, going to the gym, tending to my podcast, and promoting my book. Because of the detail I was drawing into the panels, a page would take a few days to complete. Long story short, by the time I wanted to get started on the third issue, I no longer had the energy and I needed to step away from the book for a while. The second thing that prevented me from completing the trilogy was actually a good thing – my book started taking off! For example, sales went up, my book sold out at the NSA conference in Washington, DC, readers bought multiple copies as gifts for friends or donations to libraries, and university professors used my book as a textbook or teaching aid for their speech pathology students as well as asking me to speak to their classes to talk about my book and my experiences with growing up stuttering. So I decided to put the trilogy on hold for a while and tend to increasing awareness of my book. My focus then shifted towards building up Franky Banky as I started making buttons and other merchandise. Then the inevitable – more ideas for follow up books! There is one particular idea that I am excited about and have been working on for sometime long with another idea that I’ve been tending to. And that’s drawing and posting more Franky Banky comics on a regular basis. Right here on stutteringiscool.com. So the trilogy continues being on hiatus for the time being. I can’t help it. I’m an ideas man and a creator. In the meantime, the two issues of Franky Banky Really Short Book are still up on Gumroad with a pay-what-you-want price. Previous Post Approaching Women in Bars, Clubs, etc.